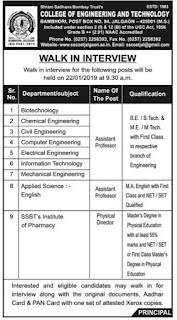 Shram Sadhana Bombay Trust's College of Engineering and Technology, Jalgaon,Maharashtra has advertised for the recruitment of Teaching Faculty- Assistant Pofessor jobs vacancies. 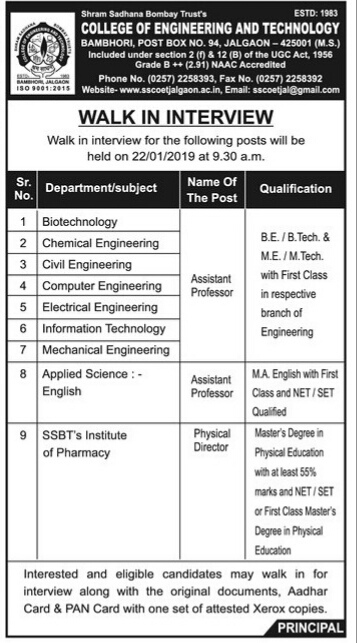 Interested and eligible job aspirants are requested to walk-in held on 22/01/2019 at 9.30a.m.Check out further more details below. About College:Shram Sadhana Bombay Trust runs the COLLEGE of ENGINEERING & TECHNOLOGY at Bambhori, Jalgaon, which is the one of the important industrial town & district headquarters of Maharashtra state. SSBT COET campus is lush green spread over 25 acres area and located on the bank of River Girna. The campus is well equipped with important amenities such as classrooms, drawing halls, laboratories, seminar halls, library, computer center, workshop, hostels, canteens, indoor as well as outdoor sports facilities etc. B.E,B.Tech & M.E,M.Tech with first class in respective branch of engineering. How to Apply: Interested and eligible candidates may walk in for interview along with original documents,Aadhar card ,Pan Card with one set of attested xerox copies.